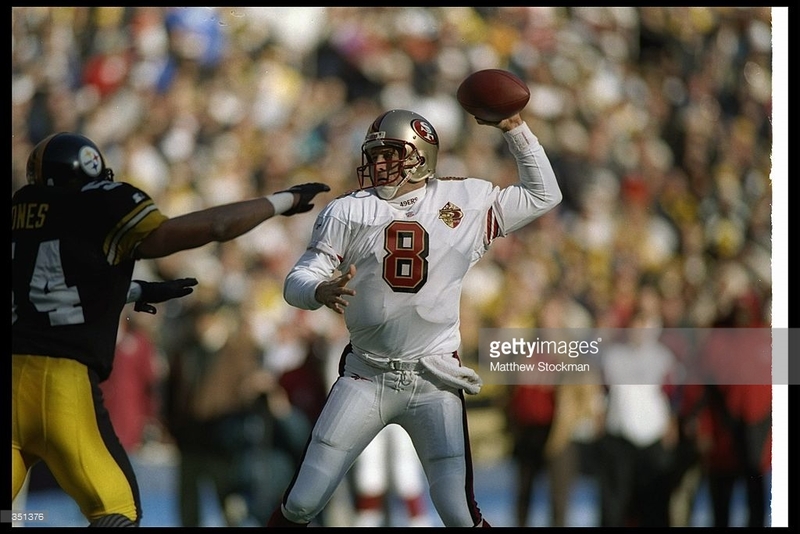 Then as I tried figure out why, I started to do a little research and noticed that it was only Steve Young’s jersey that had this thick number. Look at these photos from that same season. You can tell by the anniversary patch that it was from 1996. It appears that Young wasn’t the only one to have the thick numbers. Also, in that same season, there was a major inconsistency in fonts. Notice the below tweet with #85 and #8 in the same game. What is odd is that the number font only appeared on Young's jersey it seems. Why the switch to thinner numbers midseason (which the team-wide switch apparently happened in Week 16)? Why the different font to begin the season? It could potentially just be a manufacturing error that was corrected. But they let this go for most of the season — even during the preseason (as seen in the photo below). Then towards the end of the season, a switch. A mystery I don’t know the answer to. Another cool fact about this uniform set was that it lasted two seasons and a preseason. The team debuted gold pants as a surprise in Week 1 of the 1998 season after wearing white throughout the preseason. The 49ers changed uniform suppliers from Wilson to Reebok from 1995 to 1996, but the contract was signed late in the process and Wilson had already manufactured all of the samples during the design process. Wilson manufactured its own on-field product, where the other manufacturers used a third party. Starter used Ripon, as would Nike later on and Reebok when they took over the league-wide contract. Reebok used ACO at the time, I believe, which made uniforms for Champion as well. So Reebok takes on the 49ers in 1996 on a contract signed late. For the first set of uniforms, they used Wilson because they had done all the samples and supposedly already had sets made. They wore those for the first half of the year and replaced them with ACO jerseys with the thinner font as the season wore on. Gridiron Uniform Database has the thinner font appearing on some players as early as October. Wilson continued to make authentics for every team for a couple more years, until their NFL deal expired, and their 49ers jerseys always featured the original thicker font. This entry was posted in NFL, Old Sets, San Francisco 49ers, Uniforms & Design and tagged Uniform History. Bookmark the permalink.